In a guest post, Jennifer Goodrich from CCC reflects on the "Build vs. Buy" dilemma when managing author fees for gold open access. "In its 2014 article, “Digitizing the Consumer Decision Journey,” McKinsey & Company warns that “tools and standards are changing faster than companies can react,” and nowhere is this more true than in the field of Open Access. Open Access publishing requires new business models from publishers, new activities and expertise from authors when paying article processing charges (APCs), new relationships with institutions and funders, and enhanced systems to support all parties. It’s no surprise, then, that publishers are examining their author programs with a particular focus on creating an integrated workflow between the editorial process and the payment of APCs. As a result, many publishers are facing the choice: can they deliver what’s needed with their existing systems or should they instead be working with an outsourced partner? The “build versus buy dilemma,” of which this is but one example, is a perennial topic of debate in the field of software development – perhaps why InfoWorld described it as “a question of Shakespearean proportions.” Conventional wisdom suggests that building your own solution may be the right decision in areas of key competitive advantage, or where there is no suitable commercial product to deliver your core business requirements. By contrast, buying is often a more cost-effective way to automate and standardize core business processes, and allows the organization to manage risk by transferring the burden of software development and maintenance onto a third party. But which of these scenarios applies in the case of the management of author fees? The answer will depend on the needs of each organization, but when faced with a rapidly changing environment like Open Access publishing, McKinsey suggests many organizations need to adopt a different approach to managing the consumer decision journey—one that embraces the speed that digitization brings and focuses on capabilities in three areas: Discover, Design and Deliver. Here is how each of these can be applied to the challenge of managing author fees, and what the implications might be when considering a systems solution. In the context of Open Access, the Discover phase means drawing upon information about the author (including reviewer or editorial status), the manuscript and publication, the author’s institution, the author’s funding sources, the author’s membership status and more to develop a full customer portrait. Publishers are under growing pressure to capture and share industry standard metadata such as ORCIDs, ISNIs, DOIs, FundRef IDs and Ringgold IDs. They must therefore invest in the interoperability of their existing systems that contain data about authors and their institutions, and also find ways to allow external systems to draw on this information. Unfortunately, for most publishers, the information in question resides in disparate legacy systems that are not currently integrated and which rely on proprietary identifiers rather than external data standards. Further, with the growth of OA journals and now books, the volume of author transactions is escalating rapidly, and publishers are managing these transactions on systems that were designed for annual subscription fees, rather than for high-volume real-time transactions. As a result, in order to develop a robust author-centric solution, publishers typically have to dedicate significant resources to both unifying legacy systems and building a new transaction system that can evolve with the marketplace and be ready for numerous emerging standards. A fully unified set of internal systems might be the ultimate goal, but it is likely to come at a high price in terms of development costs and management time. For this reason, an outsourced solution can often make more sense in a resource-constrained environment or where there is a need to deliver a solution within a shorter timeframe. The design phase is about creating a frictionless experience that uses the data gathered in the discovery phase to ensure interactions are expressly tailored to an author’s stage in his or her publication journey. Publishers have rightly identified that maintaining high levels of customer satisfaction among authors is critical in an Open Access model. A recent report by Forrester Consulting for the Technology Business Management Council called “The Business Technology Scorecard” highlighted that companies now live in the “Age of the Customer.” For publishers, this global trend is already apparent in the move from annually billing institutions for subscriptions to daily collection of APCs from authors. In this new paradigm, authors cannot be kept at arm’s length from billing and payment processes, which now form an integral part of the author experience. This requires publishers to dramatically shift how their organizations operate – from a business-to-business (B2B) model centered on selling subscriptions to a business-to-consumer (B2C) model centered on managing an exponentially greater number of micro transactions for APCs. Furthermore, authors’ expectations of online payment solutions are very high. We all live in the digital world of online service providers such as Amazon, Google and Apple, which develop convenient, easy-to-use applications to which we have become accustomed. The pricing of an APC is often dependent on a far larger range of variables than an iTunes download or an Amazon eBook, but these services set the benchmark for a seamless user experience. Rightly or wrongly, manual, slow or partially automated payment solutions that seem clunky and antiquated negatively impact an author’s perception of a publisher. Instead, authors expect intuitive user interfaces (UIs) and robust workflows when they submit manuscripts and pay author charges. Any system used for this purpose is likely to need some sophisticated algorithms “under the hood” in order to meet these expectations. Finally, the Deliver phase requires the creation of a more agile organization with the right people, tools, and processes. McKinsey highlights the need for cross-functional teams with "strong collaborative and communication skills and a relentless commitment to iterative testing, learning, and scaling—at a pace that many companies may find challenging.” For publishers, this means developing closer links among editorial, production, finance and operations teams who may have had relatively little contact under a subscription model. To make it easy to support these cross-functional teams, a robust APC solution must offer simple management of complex pricing, discounting and compliance reporting. It should also be robust enough to test and implement promotional codes and discounts based on factors such as location of the author, institutional affiliation, subscription status of the institution, and membership status of the author, allowing publishers to iterate quickly in response to market demand. Flexibility is the key in this phase of activity, and any solution needs to accommodate this or risk undermining the organization’s capacity to evolve and develop. Having discussed some of the main characteristics of, and challenges to, efficient APC payment processes, we still have to resolve the build versus buy dilemma. In some cases this will come down to an evaluation of the likely return on investment from each of the two options, meaning needing to develop a good understanding of the potential costs and benefits in each case. This needs careful thought, both in testing the market for outsourced solutions and in being realistic about the costs of in-house development and ongoing maintenance, which are frequently under-estimated. Even for the very largest publishers, it‘s difficult to make the case to support the upfront investment needed in development of their own systems. It is often a cost-benefit decision, and the ability to share some of the risk with a third party can be a decisive factor. Consistency and predictability will be crucial considerations in your decision – errors and unscheduled downtime in this area can quickly cost money, not to mention the risk of reputational damage. However, as Tom DeMarco, principal of the Atlantic Systems Guild has noted: “The more important goal is transformation – creating software that changes the world or that transforms a company or how it does business.” If your chosen author fee management solution can deliver this, you really will have resolved the build versus buy dilemma. Jennifer Goodrich is Director of Product Management at Copyright Clearance Center (CCC). 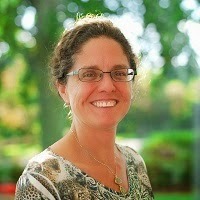 She is responsible for driving the development and evolution of CCC’s RightsLink® for Open Access platform. The platform, built on ten years of experience assisting publishers in collecting author charges, is CCC’s next-generation service designed to simplify the collection and management of article processing charges or APCs. She and the RightsLink team work closely with publishers, authors, manuscript management systems, standards organizations, as well as academic and funding institutions, to ensure the platform meets the needs of the Open Access community. If you are going to the London Book Fair, CCC will be hosting a panel discussion, “You Made the Move to Open Access: What’s Next for Your Business?” on Tuesday, 14 April, 16:00 – 17:00 in The Faculty. CCC is located at Stand 7C16.